Professional Marijuana Grower is published 6 times per year and distributed to licensed growing facilities, processors and dispensaries. Each issue offers an affordable way to reach licensed growing facilities, processors and dispensaries in states that have legalized cannabis cultivation. A digital version of each issue that can be read on cell phones and tablets is posted on our website that averages over 6,300 visitors each month. Total print, digital issue subscriber and website distribution is over 22,000 readers per issue. 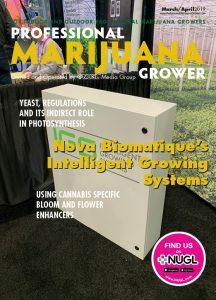 Editorial content is dedicated to helping professional growers cultivate marijuana more efficiently and profitably within greenhouses, indoor gardens and outdoor growing facilities. We support our advertisers by publishing their product releases & news items for free and encouraging them to submit potential articles & product features. Editorial based advertising packages are available to advertisers. Is Print Really Dead? Watch This and Learn Nothing Could be Further From the Truth! Thanks for your interest in Professional Marijuana Grower!